It was just the four of us for Christmas this year. No family. No traveling. Just us. Typically we go big and smoke a prime rib or brisket (which we ended up doing for New Years), or something equally grand. But this year we swayed from tradition. We still wanted something smoked (sheesh, we can’t sway THAT far from traditions! ), and something warm and comforting, easy to make, yet still elegant and festive. We decided on Coq au Vin. But that is traditionally made by pan searing the chicken to get it started, then cooking everything in a large pot in the oven. We wanted to see if we could smoke the dish. 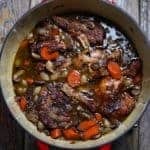 So we decided to adapt our favorite Coq au Vin recipe, from my shero herself, Ina Garten, and add our own smoked touches. This allows for the parts of the chicken to cook more evenly. It’s not necessary, but we find that you get the most moisture throughout, allowing every part to come to temperature, without anything drying out. We season simply, with lots of olive oil, and a generous amount of kosher salt and freshly cracked pepper. *Don’t be mislead by the pic. Only one chicken is needed for the recipe. We just like to make extra to have chicken on hand for easy lunches, and bonus: to make smoked chicken stock to use later in the month! Cook the chicken to 165 degrees with a good thermometer like this one. This should take roughly two hours but always cook to temp, not time. Then let the bird sit under foil for 30 minutes to allow the juices to redistribute and settle. While the chicken is resting you can start on the rest of your dish. Once the chicken has rested quarter the bird, or cut into four pieces. Two breasts and then the two thigh/leg combos. Throw the wings in there for fun and flavor. Start your stew by cooking up the bacon till crispy, then softening all of the vegetables. Add your liquids then the quartered chicken pieces. Cover then put in the oven for just about 30 minutes, and then follow the rest of the instructions below. Because we already pre-smoked the chicken all we’re doing in this step is allowing the flavors of the stew to develop, thicken, and reduce. We’re not concerned about making sure the chicken cooks through, because that already happened. 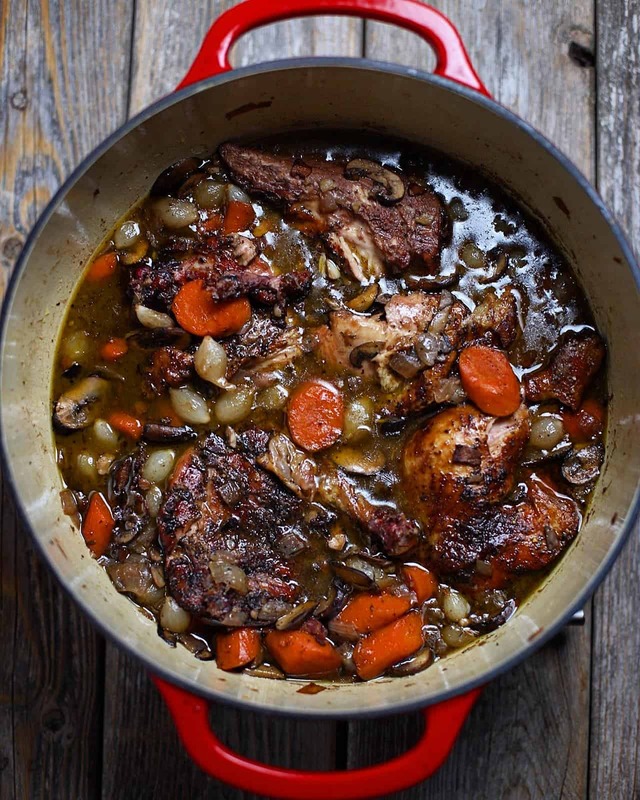 How to add smoke flavor to a traditional Coq au Vin. 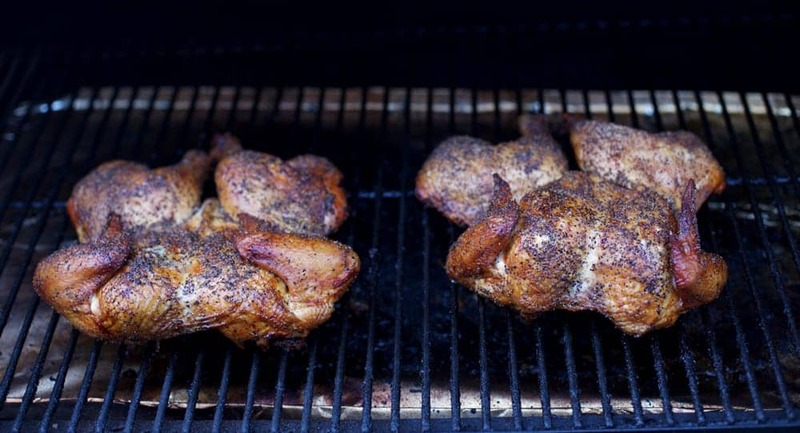 Smoke the chicken on your smoker, then build your stew with the pre-smoked chicken pieces. Adds incredible flavor to this classic French dish. Recipe adapted by Ina Garten. Preheat smoker to 225 degrees, using fruit wood (we used cherry). Spatchcock the bird (see above). Coat the chicken generously with olive oil, salt, and pepper. 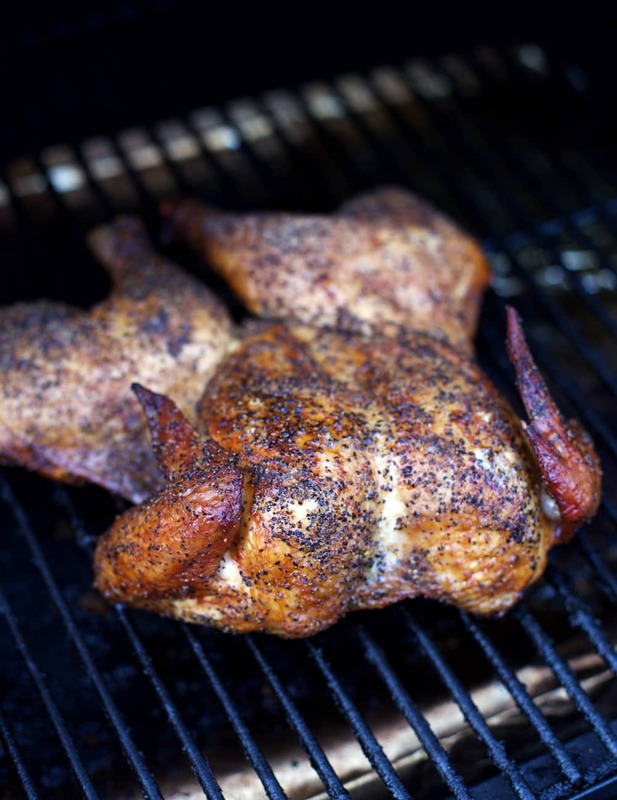 Place on smoker until the internal temperature of the chicken is 165 degrees (approximately 2 hours). Preheat a large ovenproof pot (like a cast iron Dutch oven) to medium heat. Add 1 tablespoon of olive oil then the bacon. Cook until bacon is crispy (8-10 min) then remove bacon and most of the bacon drippings. Leaving too much rendered fat will make dish oily. Add onions and carrots to that same pot and cook for 8-10 min, to soften. Add garlic and cook for 1 additional minute. You want the veggies translucent, not caramelized. Next add the bourbon, wine, and stock. Add your cut up chicken pieces, the thyme, and frozen onions. Bring to a simmer. Transfer to oven for 30 minutes. While the pot is in the oven get started on your mushrooms. In a medium saucepan, set to medium heat, add 1 tablespoon of butter and the mushrooms and cook for approx 10 minutes, or until nicely browned. As Julia Child said "don't crowd the mushrooms", we did ours in two batches. Transfer pot from oven back to the stovetop and add the mushrooms, and bring back to a simmer. In a small bowl mash together one tablespoon butter and the flour. Mix into the stew. Continue simmering the dish on the stovetop for an additional 10 minutes for desired thickness. Just before serving, pull out the thyme leaves wrapped in the string and season with a little salt and pepper to taste. Tip: for portions remove chicken and cut into smaller pieces. Or could shred before putting into pot. Some of the ingredients were changed, and the technique differs completely. This classic French dish is traditionally served with red Burgundy (Pinot Noir), or another light to medium bodied red with high acidity. It’s an earthy rustic dish, and goes fantastic with a rustic or earthy wine. So that’s usually our go-to. And we almost always use a decent quality Pinot Noir to cook the dish with. It doesn’t have to be anything fancy, just something that you would happily drink. The easiest bet is to use the same wine to drink as you are cooking with. But when we tried this with a Pinot Noir from Louis Jadot (which we used for the braising wine), it got a little masked by the smokiness of the chicken. The wine is just fine on its own, easy drinking, nice balance of red berries and earth. But there was more richness to this dish than a typical Coq au Vin, likely due to the smoked meat. 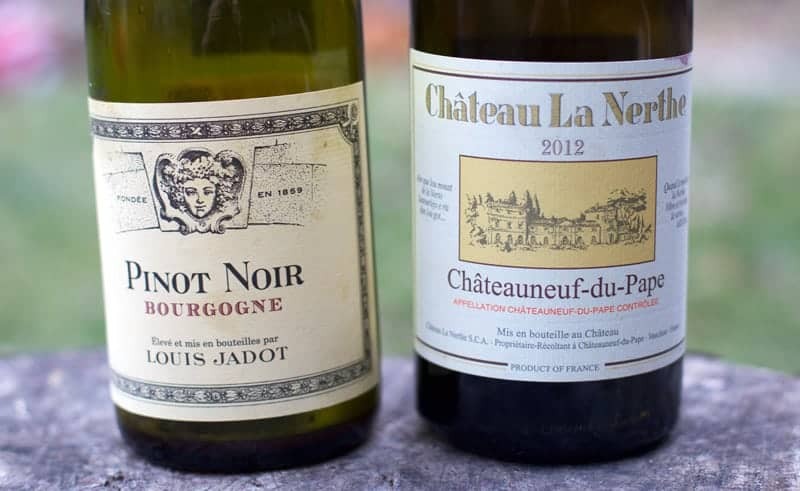 We then decided to try a Châteauneuf-du-Pape from Château La Nerthe, which I was admittedly a little nervous about thinking the opposite could occur, that the wine would overpower the dish. That didn’t happen at all. Hot damn this was a fantastic wine and was a darn delicious match for the dish. Blended from 48% Grenache Noir, 29% Syrah, 22% Mourvèdre, 1% Cinsault, this wine was rich, yet well balanced with elegance. It had some rich blackberry and plum balanced by some herbs, spices, and earth tones. It even had some smokiness to it that complimented the chicken perfectly. This was a spot on match and another lesson to take some chances when pairing. I was hesitant to pair these two, but they ended up being a memorable match. 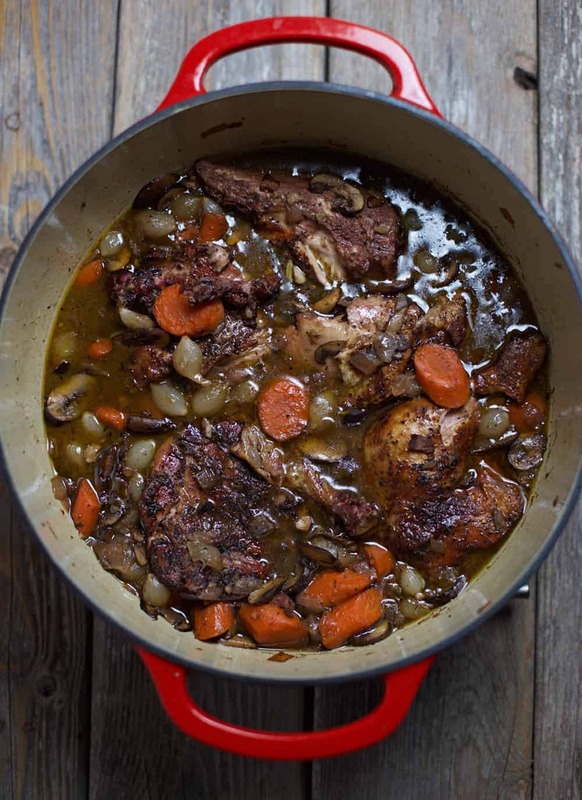 Have you ever tried to add smoky flavor to a traditional French classic like Coq au Vin? Tell me about your experience!!! The wines were provided as samples for review. See my review policy here. *This post contains an affiliate link for the Thermapen Mk4 digital read thermometer. We only recommend products we use and love! And you can’t smoke meat to the perfect temperature without one! You can always be certain if you have good thermometer and this one is awesome. This sounds amazing Mary – I love how you find ways to put a unique (smoked) taste on so many different dishes. And, thank you for taste testing the wines to get the pairings just right 😉 I can always count on you for fantastic wine pairing suggestions! This looks and sounds amazing!! We haven’t used our grill in a couple years since our last place stopped allowing them, but we should pull it out soon and get more creative! All we usually do are burgers and skewers! A SMOKED Coq au Vin?! This sounds amazing! And the chicken looks cooked to perfection. Love the wine pairings too. Thanks, Mary!